This product was added to our database on Wednesday 25 August 2010. Introduced in 1957, the Vulcan was the world's first big Delta Winged bomber to go into service. One of the most graceful aircraft ever to fly, the Vulcan will always be remembered for its exciting displays at airshows. 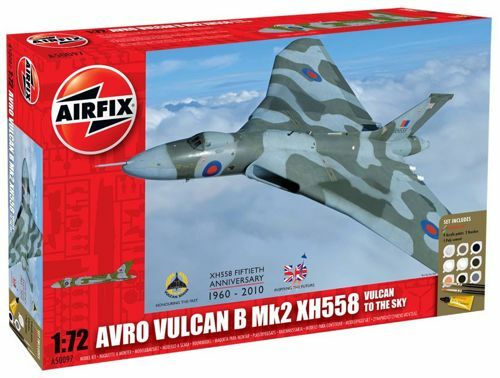 This Gift Set includes the 1:72 scale kit and also includes the required paints to complete the model (9 Humbrol Acrylic Paints), 2 paint brushes and glue (Humbrol Precision Poly Cement).